Nautilus Hyosung Inc. is a technology leader of self-service solutions in hardware, software and banking services to the financial sector. With over 30 years of experience in the industry, Nautilus Hyosung has developed proven technologies to help customers achieve greater effectiveness in their businesses with a better bottom line. Established in 1983, the electronic communication research center of Nautilus Hyosung is the largest banking automation system and mechatronics research center in South Korea. It is capable of developing hardware and software on its own, and is developing advanced automated machines, kiosk terminals, and core modules. 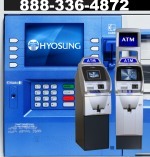 The Nautilus Hyosung MX4000 is one of the most innovative and cost effective ATMs available in the retail market. Most indoor ATMs boast about their small footprint, meaning how much space on the floor that the machine takes up. With the MX4000 ATM, there is no footprint. It is made to install on a wall. Click on the MX4000 ATM for more information. The MX5300 series ATM, a product of Nautilus Hyosung’s ATM technology acquired from years of experience in the retail industry, is engineered to provide outstanding reliability when a high traffic ATM is needed. This is not your ordinary ATM. This is not a substitute for the Halo or NH2700. The MX5300CE ATM weighs in at over 600 pounds! The MX5300XP ATM weighs in at over 1800 pounds. Both feature a huge 15" Color TFT display.